DUBLIN, Ohio (AP) Jack Nicklaus had small wagers in practice rounds during his time on the PGA Tour, just like everyone else. Some players before his time made more money in practice round bets than at the tournament when the prize money was small. But he says he never had a wager with another player during a tournament. He recalled only one time when he had money riding on the outcome, and he was still an amateur. Nicklaus had a chance to win until missing short putts down the stretch. He was paired the final round with Ben Hogan, who also had a chance to win until he hit into the water on the 17th hole. Arnold Palmer charged from seven shots behind that day by driving the first green and closing with a 65 for his only U.S. Open title. Nicklaus chuckled at the memory. One big difference at Shinnecock Hills for this year’s U.S. Open is the rough around most of the greens. Trying to respect the design of William Flynn, the USGA this year has cut the grass surrounding the greens to create situations where a shot missing the green will run down a slope some 15 yards or more away from the putting surface. Jason Dufner would agree with that. He said Tuesday he prefers to have up to 5 inches of rough around greens that are firm and fast. Then he was asked what he doesn’t like about runoffs. Laura Davies is teeing it up against the men this week in Denmark, and it isn’t the first time. Davies will become the first woman to play on the Staysure Tour, the senior circuit on the European Tour, at the Shipco Masters. Davies was among the first women in the last 20 years to compete against men. Europe’s greatest female player took part in an exhibition called the ”Super Tour” in 1998 in which nine pros matched scorecards from rounds in four Asian cities over four days. Vijay Singh won. Davies finished 39 shots behind. She also played the Korean Open on the Asian Tour in 2003 and missed the cut. Earlier this year, the European Tour had two all-women teams in its GolfSixes events, and a mixed team of Ryder Cup captain Thomas Bjorn and Solheim Cup captain Catriona Matthew. Davies committed to the senior event in August and said her anticipation has only grown. Davies has four majors among 86 victories around the world. She was inducted into the World Golf Hall of Fame in 2015. Justin Rose only played Colonial because of scheduling. The PGA Tour has a policy that requires him to play a tournament he has not been to in the last four years (he played the Sony Open last season), and he didn’t have many choices. Rose won by three shots at the Fort Worth Invitational, extending a meaningful streak to him. He now has won at least once every year dating to 2010, which includes his gold medal from the Olympics in 2016 at Rio. Playing the Colonial meant missing the BMW PGA Championship at Wentworth in England. The 37-year-old Englishman said he is required to play in his home country, but he is hosting the British Masters later this year in England. And it won’t be a problem next year because Wentworth moves to September. Tiger Woods isn’t the only multiple Memorial champion in the field at Muirfield Village for the first time since 2015. Kenny Perry has a few big tournaments coming up, and he’s trying to get his game in shape from surgery on his right shoulder last November. Perry is exempt from having won the Memorial in 1991, the first of his three victories at the course Jack Nicklaus built. He also won in 2003 and 2008. ”I need some rounds,” Perry said Tuesday on the range. He returned to the PGA Tour Champions for the Legends of Golf team event, tied for fifth at the Insperity Invitational and played the last two weeks in senior majors. He returns to the U.S. Open in two weeks as the U.S. Senior Open champion. Perry showed up with a Golden Bear logo on the crest of his shirt. He signed a deal with Nicklaus’ company at the start of the year. Wake Forest junior Jennifer Kupcho and Arizona junior Bianca Pagdanganan received exemptions to the Marathon Classic on the LPGA Tour in July. Kupcho won the NCAA title, and Pagdanganan delivered clutch shots to help the Wildcats win the team title. 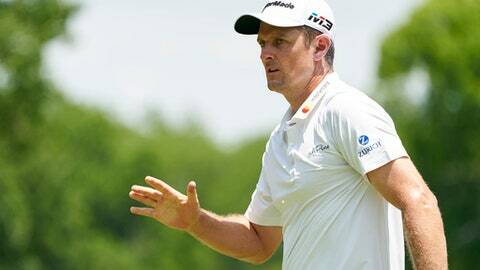 … With his victory at Colonial, Justin Rose tied Nick Faldo for most PGA Tour victories (nine) by an Englishman since 1983. … Dustin Johnson contemplated replacing his 3-wood with a 5-wood because the 3-wood was going too far. On the range at Muirfield Village, one shot with his 5-wood went 275 yards. … The LPGA Tour has not had a multiple winner after 13 tournaments this season. A year ago, it did not have a multiple winner (So Yeon Ryu) until the 16th event on its schedule. Jon Rahm tied for fifth at Colonial and went over the $10 million mark in PGA Tour earnings in his 41st tournament. ”I lost.” – Jack Nicklaus, on his recollection from his first U.S. Open at Shinnecock Hills in 1986. He tied for eighth.